On your arrival at international airport in Bangalore and after clearing customs & immigration, our representative will greet you and transfer to the hotel. 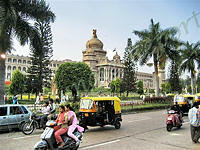 Bangalore is the capital city of the Indian state of Karnatakam and is India's third most populous city. Bangalore is known as the Silicon Valley of India because of its role as the nation's leading Information Technology (IT) exporter. Located at a height of over 3,000 feet (914.4 m) above sea level, Bangalore is known for its pleasant climate throughout the year. Overnight at Bangalore. After breakfast take a sightseeing tour of the bustling city of Bangalore, including Tipu's Palace, Vidhana Sabha and Lalbagh Botanical Garden. Tipu Sultan's Palace and Fort was originally built by Chikkadeva Raya in mud but later reconstructed in Indo-Islamic architecture and completed by his son, Tipu Sultan, in 1791. Thes enchanting Lalbagh Botanical Garden is set on 240 acres with a rare collection of tropical and sub-tropical trees and plants, and a majestic glasshouse constructed in 1889 to commemorate the visit of the Prince of Wales. After lunch we drive to Mysore (3 hrs), visiting enroute Rangnathitoo, a famous bird sanctuary, just 25 km away from Mysore. It is home to an astonishing variety of migratory birds from as far away as Siberia. Finish the drive to Mysore and check int hotel. 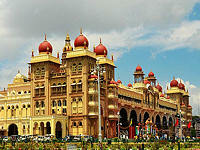 Overnight in Mysore. After breakfast drive to Hassan (135 Kms/3 Hours) enroute visiting Sarvanbelagola, an important pilgrimage site for followeres of the Jain religion. Its twin hills are home to many temples and statues, inclding the world's largest monolithic stone staue, that of Gommateshvara located on Vindyagiri Hill. 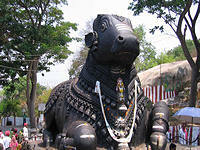 Afterwards, continue the drive to Hassan and visit the Chennakeshava temple complex. Overnight at Hassan. After breakfast drive to Hospet (325 Kms/6 hrs) visiting enroute the Halebidu temples. The temple complex comprises two Hindu temples, the Hoysaleshawara and Kedareshwara temples and two Jain basadi, situated by a lake. The Hoysaleswara temple, dating back to the 1121 C.E., is astounding for its wealth of sculptural details. The walls of the temple are covered with an endless variety of depictions from Hindu mythology, animals, birds and Shilabalikas or dancing figures. Yet no two sculptures of the temple are the same. Continue the drive to Hospet, and check in at hotel. Overnight at Hospet. 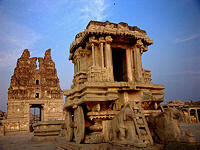 After breakfast we take an excursion to Hampi including Hampi ruins, Vittala Temple Complex and Virupaksha temple. 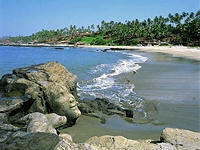 Hampi is a small village on the southern bank of the Tungabhadra river and is a well-known centre of pilgrimage. Here the ruins of the Vijayanagar empire are spread over a 26 sq km. area. In particular, the Hampi ruins are a UNESCO world heritage site. Return to Hospet and overnight. After breakfast drive to Badami (170 Kms / 3-4 hrs) enroute visit Pattadakal and Aihole. Pattadakal is a World Heritage site, a village and an important tourist centre in the state of Karnataka located on the left bank of the Malaprabha River. The Pre-Chalukya historical and Archaeological site Bachinagudda is also near Pattadakal. Aihole is a village having a historic temple complex known for Chalukyan architecture, with about 125 stone temples dating from 5th century CE. With its collection of architectural structures, Aihole has the potential to be included as a UNESCO World heritage site. Continue drive to Badami,famous for rock cut and other temples and located in a ravine at the foot of a rugged, red sandstone outcrop that surrounds Agastya lake. Overnight at Badami. After breakfast visit Badami Caves. 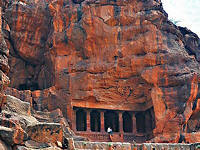 The Badami cave temples are composed of four caves, all carved out of the soft Badami sandstone on a hill cliff in the late 6th to 7th centuries. Rest of the day is free at leisure or a guide can be arranged for a short hiking trip to admire the panoramic view of valley. Overnight at Badami. After breakfast drive to Goa (250 Kms/05-06 Hours), on arrival check in at hotel. Rest of day free at leisure. After breakfast, transfer to airport for flight to Bangalore or Mumbai. On arrival, transfer to hotel for day use of room for wash and change, and later transfer to airport for flight to UK. Accommodation with meals as shown (B/L/D).